How much house can I afford? This might be what you’re thinking about now. You have to make the decision after considering your actual debt amount, credit score, your income, and other expenses. But choosing the best mortgage loan also require detail knowledge of all the mortgage options you can find in the market. Before choosing the best mortgage for you, you need to know about available mortgage options and their pros and cons. Practically, mortgage loans are divided into several categories, based on different factors. There are two main mortgages based on their characteristics. Option 1. Conventional loan - It is backed by a private lender, banking institution, or a credit union. Stable income and a good credit score is needed to qualify for a conventional loan. It also requires a large down payment, at least 20% of the purchase value. If the borrower can’t give that money, he/she might have to opt for private mortgage insurance (PMI). Conventional loans provide borrowers the option to choose the loan tenure of 10, 15, 20, or 30 years. FHA loans – These are insured by the Federal Housing Administration to help the new home-buyers. These loans are affordable; a borrower needs to pay a minimum down payment (nearly as 3.5% of the purchase value). VA loans - These are backed by the Department of Veterans Affairs. This program offers a low or zero down mortgage options and a competitive rate of interest. But there is a catch, this program is only available to ex-military men and their families, and active military service members. USDA loans – These loans are provided by the U.S. Department of Agriculture. An USDA loan is totally dedicated to help the rural property buyers. USDA loan is very helpful for the home buyers with low-income levels. All of these three loan programs offer several benefits to the home buyers, especially with a low down payment requirement. Now, let’s decide which loan option is right for you. Is it a conventional mortgage or should you go for the government-backed loans? Basically, If you don’t have a steady income, or an enough fund for the down payment, then you should think of a government-backed loan. But with a good credit score and steady income, you might consider a conventional mortgage. Considering the type of interest rates, you may have two mortgage options. Option 1. Fixed rate mortgage (FRM) – If you choose a fixed rate mortgage, that means you have to pay a fixed amount as mortgage payment each month. You’ll have an idea about your monthly loan payments, so it’ll help you to form a budget plan. The interest rate will be fixed for a certain period like - 10, 15, or 30 years. If the market interest rate changes during this period, it’ll have no effect on your mortgage interest per month. After that the interest rate may vary as per the market rate. Option 2. Adjustable rate mortgage (ARM) - An adjustable-rate mortgage or an ARM is a well known mortgage option. The main 4 components of an ARM are: a) an index, b) a margin, c) a cap on interest rate, and d) an initial lower interest rate. ARM rates are usually lower than the long-term rates of FRM. So, is also called teaser rates. At the end of the initial term, the interest rate might increase or decrease as per the current market rate, and so as your monthly mortgage payment. Different types of ARM may include 7/1 ARM, 1/1 ARM, 3/3 ARM, etc. An ARM is a good option for those first-time homebuyers who may want to live in the house for a short time period (4 - 5 years) or refinance their fixed rate mortgage after the teaser rate. Borrowers have to pay less interest in the initial years, so they can save a good amount from there. That amount can be invested to other places like a retirement account. Now which one is the best mortgage option for you? If you don’t want to take risk of a mortgage interest rate hike or you have plans to stay in your home for a long time and pay off the mortgage, an FRM would be the right choice for you. If you are getting a low initial rate on a fixed rate mortgage, locking the rate might be a wise decision for you. In the long run, it may save you a lot. On the other hand, if you have plans to sell your home within a short time frame (maybe in 5 or 7 years), an ARM would be the perfect choice for you. Also, if you assume that in the future the rates might drop, having an ARM may help you to refinance your home to a lower rate. Based on the size of the loan, home loans also have 2 main options. Option 1. Conforming – These loans strictly follows the loan limit guidelines set by Fannie Mae and Freddie Mac. As of 2018, single-family homes in most of the US have conforming home loans limited to $453,100. In rich, high-cost areas like Alaska and Hawaii, the conforming loan limit on single-family homes is as much high as $679,650. Option 2. Non-conforming – This is the loan which does not fulfill the guideline of Fannie Mae and Freddie Mac One of the most popular non-conforming loans is a jumbo loan. Jumbo loan amounts are higher than the conforming loan limits in their particular neighborhood areas. Jumbo loans are designed to save the interest of the lenders; that’s why they are higher and riskier. If you need a lower interest rate, then you might have to follow the guidelines and stay within conforming loan limits. Non-conforming loans are quite costly compared to conforming loans. All of the above-mentioned loan options are quite lucrative. But you need to understand, not all of them are designed for you. 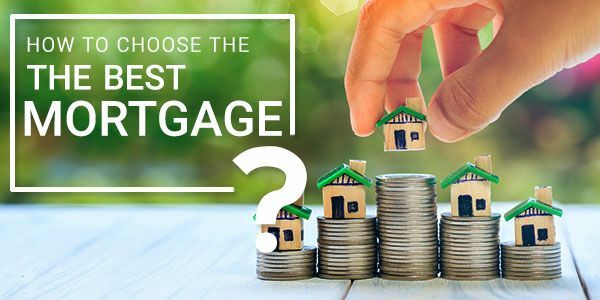 How to choose the best mortgage for you - the answer to this question is hidden inside the choices you make. Before you start shopping for a home loan, gather all the documents you need, determine for how many years you want to carry out the loan, and how many years you are gonna live in that house. Try to boost your credit score and save as much as possible for the down payment.